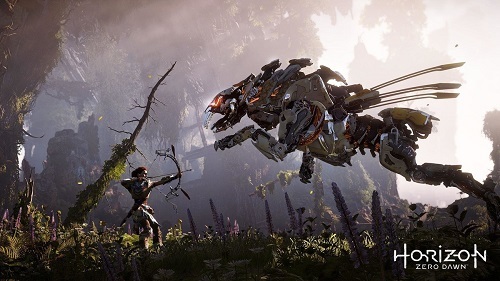 This week we get into the huge open world, post-post-apocalypse by Guerrilla Games, Horizon: Zero Dawn. I’m going to come out any say it, this game has a really bad opening few hours. I say on the podcast that were it not for the podcast, I would have checked out after two. They are so abysmally slow and make the hunting combat, side quests and world traversal and all you can find in it so tedious and dull. It doesn’t help that most of the voice acting the opening area is stilted and just bad. Like 90s get the janitor to record some lines bad. Then around the 6 hour mark the world gets compelling, the story gets detailed that makes it interesting and you get a few new abilities that finally allow the combat to show off its unique rhythm. By hour 15, I’m in love with this game. It’s both a meditation of mythology as it constructs the world’s creation mythology as you play a central role in a mythological hero story. It’s a work that decides to play the long game with its material and while it may hurt the opening, I can now see that important ground work was being laid down mechanically, narratively and character development wise. That arc is where out discussion starts, but recognizing it as a mythological allowed us to read further into what the devs were playing with. We also talk about the arrogance of tech culture, the subtle statements made about gender roles in society, and the diversity of race on display among the cast that the developers went to the care of crafting. You can find it on PopMatters, SoundCloud, iTunes and through the RSS feed.